McConnell: Republicans Decided to "Stand up to the Mob" and "Not Be Intimidated"
Senate Majority Leader Mitch McConnell sat down with Fox News' Laura Ingraham to discuss his strategy and how the Senate GOP weathered the past three weeks of turmoil as Supreme Court Nominee Brett Kavanaugh faced allegations of sexual assaults as well as an increasingly growing mob left-wing of protesters around the capitol and throughout the media. "We've sort of been under assault, and everybody decided to stand up to the mob, to not be intimidated by these people," Sen. McConnell told Ingraham. Ultimately, after an FBI investigation and exhaustive hearings and testimony, the Senate Judiciary Committee moved to vote for the confirmation of Brett Kavanaugh. Sen. Susan Collins, a moderate Republican from Maine, announced her support for Brett Kavanaugh in a speech that fellow colleagues such as Sen. Lindsay Graham (R-SC) say "should be required viewing in every civics class in America." "Unlike most Kavanaugh critics, she actually took the time to do her job. She read his opinions, she had in-depth interviews, she listened to the accusers, and she applied a process of the rule of law versus the rule of the mob. She rose to the occasion," Sen. Graham added. Following her speech, "This is a great day for America," McConnell remarked. "The mob was not able to intimidate the Senate." 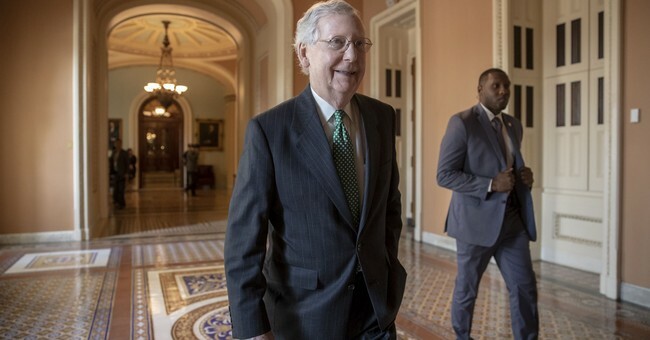 Sen. McConnell also revealed that he was uncertain Brett Kavanaugh had enough votes until the final cloture vote.